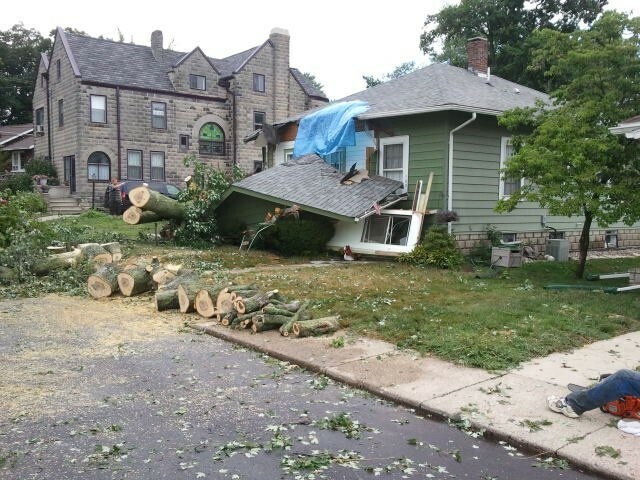 Today’s storm blew a large tree onto the Fifth Street home of Joann Wilcoxson, doing damage to the front of the house. Tom Avey, Fellowship Coordinator, lives in the house to the left. The storm blew down a number of large trees along the Winona lakefront and up Park Avenue in the vicinity of the Rodeheaver Auditorium, in front of the town park and city hall, and even further up along Boy’s City Drive. Thirteenth street was closed for a time because of a large tree that fell in the street, and a large tree on the lakefront by the BoatHouse restaurant was uprooted and fell back toward the parking lot. Electrical power to the area was off for about an hour, with an estimated 3,000 customers affected. All stoplights along Rt. 30 throughout the Warsaw/Winona Lake region were out for a time, as well.